What is Managerial economics tutorial? 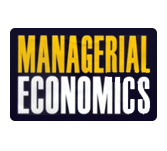 Managerial economics deals with the application of economic concepts and economic analysis related to the rational managerial decisions. This tutorial provides an approach related to the topics of managerial economics such as micro, macro, and managerial economic relationship; demand forecasting, production and cost analysis, market structure and pricing theory. This tutorial is targeted for management students who wish to seek business concepts. It provides overall understanding of the major topics of management economics. To learn this tutorial one must be familiar with the related concepts explained here with a basic knowledge of management studies.